Here you can find everything you need to know to get started with the CNCnetPDM MTConnect adapter. 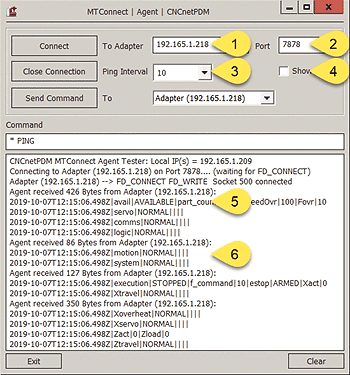 This section shows all necessary steps to setup CNCnetPDM, use the MTConnect agent test program, receive adapter output and control agent output. A description of available commands to control the adapter is also included. In case you access CNCnetPDM from a remote PC make sure that TCP port 7878 is not blocked by a firewall. Close CNCnetControl and double click MTConnect.exe. If CNCnetPDM is running on the same PC you just have to click [Connect]. Otherwise you have to enter the IP Address or DNS Hostname of the PC running CNCnetPDM (1) and the appropriate Port (2) default = 7878 before doing so. Initially the adapter outputs one line with ALL items (3) acquired from your device to the agent. After that, the adapter outputs only data for items that have changed (4). As described in ‘MTConnect Overview’ a line output by the adapter starts with a timestamp in UTC followed by key | value pairs delimited by a pipe character ‘|’. A key is built by the Tag Name you defined in your device specific INI file prepended by the machine number as defined in CNCnetPDM.ini. Both items are separated by the colon character ':'. By sending commands from the agent to the adapter you can control various features of the MTConnect adapter. To be able to collect machine data together with operational data the devices have to know which work-order, operation and/or part number they’re currently working on. To do so you can ‘tag’ devices with this information. This would only set work-order for machine number 1000 to 4711. You have to keep the number of pipe characters constant otherwise the command has no effect. The CNCnetPDM MTConnect adapter also allows you to set or change parameters or variables at your devices directly from an agent. However, this strongly depends on the setup of your device specific .INI file. If, for example you have a machine with number 1000 and a Sinumerik controller that uses the sinumerikda.dll OPC device driver CNCnetPDM automatically creates the INI file sinumerikda_1000.ini. In this file you can find a list of commands. Command number 21 is used to read 'R Variable 2'.